I have never been able to make salsa from scratch. I’ve made things like the arbol-tomatillo salsa for tacos con nopales and pineapple-tomatillo salsa (oooh, is that ever good), but those aren’t really salsas in my mind (even if they are). 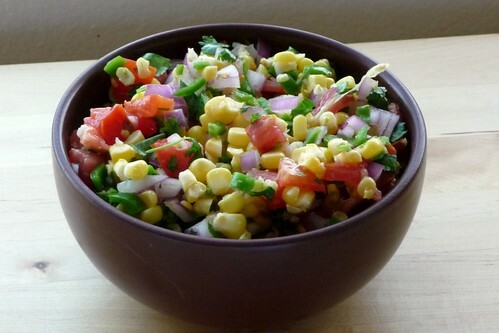 Salsa, at least the way I want to make it, is chunky, loaded with ripe tomatoes, onion and cilantro. But every time I tried, I’d fail. No idea why. But I finally broke the chain, I successfully made a fantastic scratch salsa for our taco bowls! Of course, having fantastically fresh ingredients helped. The corn and tomatoes were picked that morning by the folks locally who grew them and I’m convinced that made a difference. See, it wasn’t me who made the salsa great: it was the veggies. I like to strip back the husks of the corn and remove the silk before cooking, but you can do it after too. Replace the husk and soak corn for 15 – 20 minutes in cold water while you preheat the oven to 350F. Lay the ears right on the oven rack. Roast for 30 minutes then remove to a rack to cool. Remove the husks and silk (if necessary) and cut the kernels off the cob. In a medium bowl, combine all ingredients and mix well. Let chill for 30 minutes to allow the flavors to meld, then enjoy. This entry was posted in dairy-free, gluten-free, mexican, recipes, untranslated, vegan, vegetable, vegetarian. Bookmark the permalink.